WEARING: LUV AJ Leather Jacket, Splendid Turtleneck, Club Monaco Skirt, Fendi Spy Bag, Adidas Sneakers & Galisfly Jewellery. Transeasonal outfits are more relevant nowadays, the reason I say this is because the weather now seems to be more unpredictable than ever. So many countries are experiencing out-of-season temperatures, you just have to be prepared for anything. Within the same day it can change from sunny to hiding under an umbrella. I took advantage of a day that the sun broke out after a week of showers to go to meet up with Mackenzie for a shoot and these are the results. Can't tell you how pleased I am to be sharing some new ideas, and collaborating with him. What do you guys think of this killer LUV AJ Ponyhair Bomber jacket? I decided to pair it with a turtleneck in case the temperature cooled down, mini skirt because why not, sneakers to make the look casual and my Fendi Spy Bag. I have had this bag for a few years now and I realized that I have hardly used it, the reason was based on the belief that it was too "mature" for me at the time. When I took it out of storage this weekend, it seems to be the only bag I want to wear. Expect to see this babe around much more! Please don't forget to check out my designs here, in case you missed it last week I launched my newest campaign for the BASICS line, have a look! True love to your jacket Mel!! Wow, love it!! The bomber is amazing!!!! 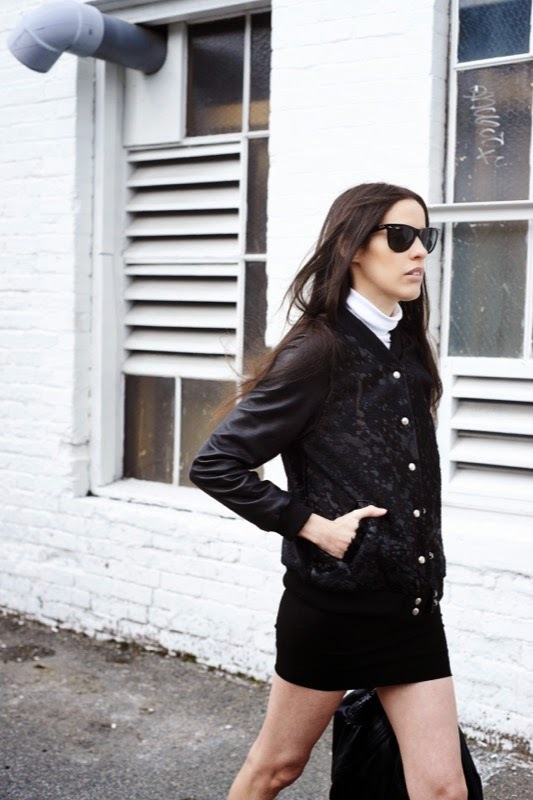 That bomber- perfect with the turtle neck.